The Goa government ordered an inquiry into an alleged ‘purification’ ceremony performed at the site in Kala Academy where the body of late Goa Chief Minister Manohar Parrikar was kept. 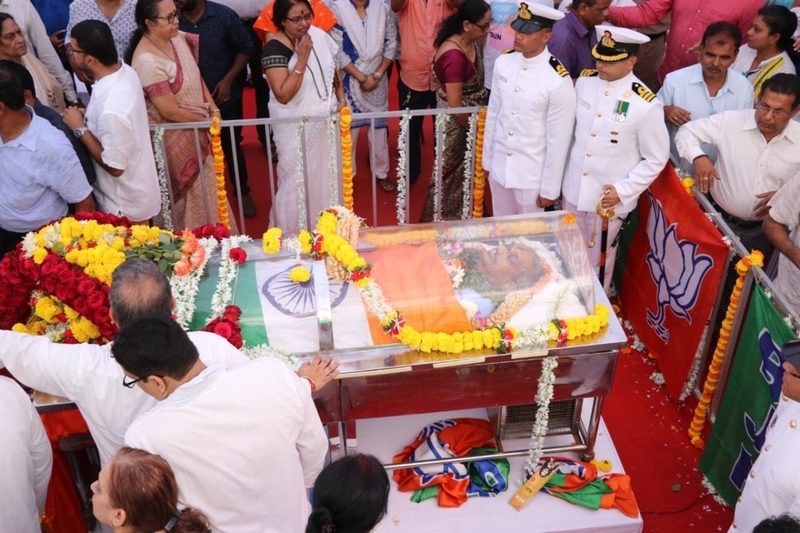 Parrikar’s body was kept at the Kala Academy for the public to pay their last respects before it was taken for cremation at the Miramar beach. In a Facebook post, Goa’s Art and Culture Minister Govind Gaude said that the Kala Academy, which functions under the aegis of his ministry, does not promote unscientific activities. “I have taken a strong note of some activities carried out in the Kala Academy premises as rituals today. I have ordered an inquiry into it. We cannot promote or patronise unscientific activities inside government buildings,” Gaude said. Parrikar died on 17 March, after a prolonged battle with pancreatic cancer. His body was kept at the BJP office for party workers to pay their respects. Reports say that four priests were called to perform the rituals by some members of the staff of the institute. Images and videos believed to be from the ceremony were shared on social media causing outrage. A government official reportedly said that it is a “shame and an insult to the CM”. “It appears that what rites the four pandits had performed was not a purification ceremony, but chanting of the Om mantra,” Gurudas Pilernekar, member secretary of the state’s premier Arts and Culture centre, told IANS. Gaude added that it was not a suddhikaran (cleansing) ritual but he is unaware of what particular ritual was held. “On Monday once the inquiry report is in I will have a better idea,” Gaude said. Reports say that the staff of the government-run institute holds religious rituals, usually once a year with prior government permission. But Gaude said that no permission was sought in this case. Parrikar passed away on 17 March after a prolonged battle with pancreatic cancer. Prime Minister Narendra Modi paid his last respects to Parrikar at the Kala Academy.